memo to self: pay dentist bill. today. Recently, a woman in the Bavarian town of Neu-Ulm had two dental bridges put in. At the time, she fully expected that her insurance company would cover the cost. Unfortunately, the company refused to pay the claim. That caused the woman's dentist to take matters into his own hands. Literally. 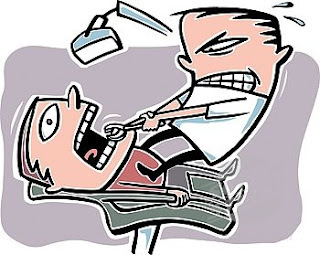 The irate dentist broke into the 37-year-old woman's home, tied her up, forced open her mouth and removed his handiwork. That's right. He repossessed her teeth by yanking them out of her head. Good thing she didn't have cornea replacements.